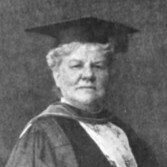 Louisa Lee Schuyler, while receiving an honorary degree at Columbia University in 1915. To say that Louisa Lee Schuyler was a humanitarian and a pioneer in social work would be an understatement. Miss Schuyler was the driving force in the movement to reform the poor house system in New York State. She was born into a life of wealth and privilege on October 26, 1837, the daughter of George Lee and Eliza (Hamilton) Schuyler; and great-granddaughter of General Phillip Schuyler and Alexander Hamilton. She founded The State Charities Aid Association on May 11, 1872, which was based in New York City and consisted of volunteer members; men and women, from all walks of life. Her involvement with the Sanitary Commission during the Civil War had taught her the great value and importance of organization. She had read the official reports about the deplorable conditions of the poor houses and alms houses in the state and knew that something had to be done about the inhumane treatment of the poor. She also knew that the “say-so” of one woman wouldn’t change anything; she needed a league of educated citizens united in a common goal. The association’s purpose was to raise the awareness of the general public to the abuses and sufferings of paupers in the poor house system; to visit every institution of charity supported by public funds in the state of New York; to report findings of mismanagement and corruption, and to make recommendations to the State Commissioners of Public Charities (later renamed The State Board of Charities). Miss Schuyler formed the association first; wrote the by-laws; encouraged her friends to join the association; visited the Westchester County Poor House and Bellevue Hospital with a few of her volunteers; and then, wrote a letter that included a complete report of the association’s findings of both institutions to the State Board of Commissioners. The association immediately received the approval of the State Commissioners and was given the right to visit and inspect the charitable public institutions under the powers and authority already held by the State Commissioners of Public Charities. There were three committees whose purpose it was to focus on the interests of the dependent classes. The categories were divided into: Children (all aspects of their welfare), Adult Able-Bodied Paupers (in poor houses and alms houses), and Hospitals (that included a sub-committee representing the Insane). Led by Miss Schuyler, Chairman of the Committee on the Insane, the State Charities Aid Association pushed for and eventually forced the passage of The State Care Act, Chapter 126, Laws of 1890. Miss Schuyler started the first Training School for Nurses in connection with Bellevue Hospital in 1873, and was instrumental in After Care of the Insane which was implemented in 1906. In 1907, she was appointed as one of the original Trustees of the Russell Sage Foundation, and in 1908, she organized the first committee of physicians and laymen for the prevention of blindness. Honored by her forty years of charitable work, she was the first woman to receive an honorary degree of laws (LL.D.) from Columbia University in 1915. Miss Schuyler died at the age of eighty-eight on October 10, 1926, in Highland Falls, Westchester County, New York. “The objects of our work are of a twofold nature. 1. To promote an active public interest in the New York State Institutions of Public Charities, with a view to the physical, mental and moral improvement of their pauper inmates. 2. To make the present pauper system more efficient, and to bring about such reforms in it as may be in accordance with the most enlightened views of Christianity, Science and Philanthropy. How to Cite this Article (APA Format): Miss Louisa Lee Schuyler (1837-1926): The State Charities Aid Association. (1901). The New York Times. Retrieved [date accessed] from /?p=10113.